Cuban multi-media talent Jesus Lara Sotelo makes art of the highest order. He paints and writes, draws, photographs, works in ceramic, sculpts. All art-forms are rendered with taste, grace and depth of meaning. The connectedness of the artist to his universe is visible in the emotional proximity with which he examines his subjects. Jesus Lara sits in front of one of his murals. Multiple themes and discussions, dialogues and monologues are evidenced in Lara Sotelo’s work as diverse and as complicated as the multi-media techniques he uses. His considerable oeuvre — more than 70 exhibitions in Europe, Africa, Latin America and North America has the attention of prestigious galleries including the Metropolitan Museum of Art, which has expressed interest in his work. 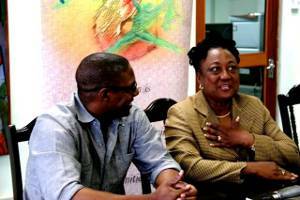 Lara recently paid a courtesy call on Chief Executive Officer of the Barbados National Cultural Foundation Dr Donna Hunte-Cox. He presented copies of his Mythology of the Extreme, a collection of aphorisms, to Hunte-Cox as well as a recent book of poems, Alicia and the Prussian Odes, dedicated to the life of Cuban primer ballerina Alicia Alonso. The NCF chief also received a copy of Ascent to the Inside of the Himalayas – an anthology of his 20 years of artistic career. His work represents an ideal that transcends the wide spectrum of artistic expression unified across genres since he is at once painter, sculptor, photographer, graphic designer, ceramist, writer and poet. “Examine Your Conscience” invites you to look at yourself in a mirror in a toilet bowl. But there are other less Duchamp-like examples of life and art in styles that challenge notions of what may be considered beautiful. The artist is not as concerned with this element of artistic depiction as he is with the truth he wishes to speak. At age 17 he worked on “Men in the Cave” about man’s isolation in the technological allegorical worlds that have sent us back to the cave, so to speak. He started writing maxims from about the same age and he has written seven books in all. To write, he creates poems and maxims and sometimes to paint the reverse is true – an inseparable union in the mind of the artist. The themes that have appeared across the spectrum of his artwork and writings throughout his career include war and peace, pride and prejudices, envy, hate and love, fear and/or lack of it, arrogance and submissiveness, bureaucracies and governments, courts, judgments and sentencing, perfection and imperfection, equalities and repression. There are references to the historical necessity and inevitability of youth to carry on works, genius and its consequential and inconsequential acts, environmental degradation, and last but certainly not least of a much longer list, spirituality, faith and God. All lead to that central philosophical question: what are truths and what makes them truths? Ultimately, they beg a larger discussion on the truth Lara wishes us to see and value. Writing the prologue to his Mythology of the Extreme, critic Rufo Caballero, states: “There is no Lara without morality, or moral aspiration. But not in the judgmental sense of one who punishes, or who separates good from evil, or chastises with the word. No. That would cause to escape from him, very strong criteria about humility and austerity. I’m referring to morality in the sense of a sensitivity that is capable of grieving through observing, much observation, and of being able to develop a repertoire for attitudes and behaviours that are the structure for a treatise about the human condition. Born in Havana, Cuba, Lara has staged 76 exhibitions, at only 38 years old. His most recent, “Supremacy of Ecstasy”, on the life and work of Alicia Alonso, comprises 48 works alone. The artist has an online Face-book website where he normally posts daily maxims and/or images of his artworks, including the monumental Make Bacon. 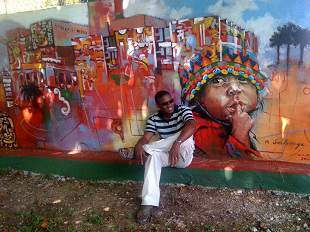 A graduate of Mechanical Design, at the Fernando Aguado and Rico Polytechnic, Centro Habana, Cuba, Lara is a member of the Cuba Writers and Artist Union (UNEAC), the “Hermanos Saiz” Association and the Cultural Heritage Fund and the José Martí Cultural Society. He is self taught as an artist, and a variety of philosophical and scientific, social and religious themes are the foundation of his works: painting, psychology, psychiatry, quantitative physics, mineralogy and others. Lara’s most famous ode to the Caribbean outside of Cuba is his memorial to Haiti – “Haiti Es Otro Guernica”. The artistic journey in this piece continues Picasso’s legacy of a memorial in painting to war which Lara transfers to the world outside of the European theatre, itself originally responsible for Haiti’s creation and demise. Jesus Lara’s Haiti Es Otro Guernica. The demonization of Haiti’s soul, which began with the French demand for reparations for the bloody end to slavery and the thrashing of the Great Napoleon, continues. “Haiti is the Other Guernica” begins the new artistic exploration of a globalised world by first examining Haiti as part of an installation called “Make Bacon”. Make Bacon is the psychological diatribe into which humans are stripped and ripped apart. Together the two are very strong political, anti-war statements. In “Make Bacon”, the artist physically partakes of the sin of destruction of his world and other humans. The impact is dramatic and profoundly moving. Lara’s work re-awakens us from the sleep brought on by the drug of a so-called peaceful, neoliberal era. Peaceful it is not. Neither is Lara’s work. It seeks to take us on a mission of discovery of the human condition is which No To War is a familiar and often repeated slogan. The slogan is present throughout the artist’s career. Technically, art meets science in an ever-evolving dynamic between artist, thought and the creative process. If there is pessimism, it is displaced by an overarching faith and a seductive fearlessness. There is a strong stoicism: it is not what a person says as much as what their behaviour unveils. If there is anything to be unleashed it is virtue, self-control, reason and if anything should at all be repressed it would be envy, jealousy and anger. “Art comes from direct impression,” Lara says, “…from the same life of the artist, just as how he/she sees and feels it, with a sense of mind and heart, with the peculiar history that is his to live, given the vicissitudes of his surroundings, time and space, his emotions and sufferings; but it is not enough to look into the depths of his being and see what perception his peculiar and unique senses have in common with everyone else and express it in a beautiful way. The properties of truth in Lara’s work and how they can be measured within the spectrum of metaphysical and epistemological approaches are certainly questions for further argument and debate. The content and abstractions in all the work, as the artist states, are well beyond the limitations of style. Yet close examination will show that there is an original path that Lara has constructed stylistically, like a chess player mapping new moves in an old game where all the rules are known. From the range of stylistic and artistic and philosophical theories combined, we have a major new figure of 21st century art on our own Caribbean doorsteps whose themes and philosophical system, based on the foundation of spiritual, religious and empirical thought, are being gradually deconstructed. This art emanates from and draws on the substantial evidence of life in the trenches that is our globalised world. The many influences converge at the peak of their expression, in a wonderful ethical and stylistic code that aims to improve conventions for human conduct and find their greatest outlet through a multi-dimensional, boundless aesthetic. At the core, is the melting pot of our Caribbean, a Caribbean that itself is in constant and perpetual evolution.